GUATEMALA Antigua, Buena Vista 2013, a set on Flickr. The Guatemala Box. It's Here! Right now I am sitting by the cupping table at Kaffa and Josh Hockin, from Transcend Coffee in Edmonton, is serving me an espresso. It’s Thursday, the 7th of June and he is preparing for the World Barista Championship in Vienna next week. The Collaborative Coffee Source, in Oslo, is about to receive its first container from Guatemala. In the container are 375 x 46kg bags (approximately 17 000 kg) of green coffee and about half of this will be shipped out to different roasters all over Europe within a week. My first visit to Guatemala occurred this winter. The purpose of the trip was personal: I wanted to vacation and learn Spanish, but I also went for the Collaborative, to source coffee. I stayed in Antigua, a city about an hour outside Guatemala City for five weeks. Antigua is one of the most beautiful cities I’ve been to and part of its beauty stems from the ruins and cobblestoned streets. 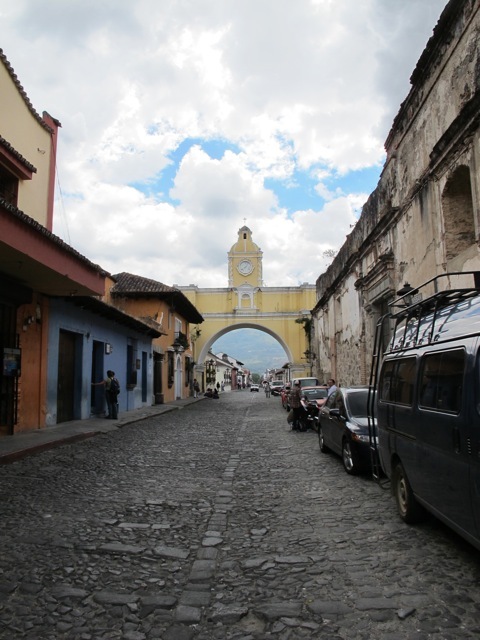 Antigua was once the capital of Guatemala for more than 200 years but after an earthquake in 1776, the capital was moved to its current location, Guatemala City. Antigua is surrounded by three volcanoes, the closest one being Vulcan de Agua (“the water Vulcan”). Near the foot of the volcano is a beneficio (i.e. mill) called Bella Vista. Bella Vista, run by Luis Pedro Zelaya, is both a farm and a wet and dry mill. All of our Guatemalan coffees this year were processed here. Luis Pedro started working at Bella Vista after being educated in Honduras. It has been in the family for generations and is now owned by Luis Pedro’s father who also is called Luis Pedro. Together they have grown the company, beginning with the managing of their own farms: Bella Vista, Pulcal, Candelaria, Buena Vista, Chuito, and Santa Clara and over time, they began to manage other farms in the Antigua region. The Zelayas have always had a focus on quality and six years ago they began separating lots. The results haven’t led to an increase in quantity but there has been a significant rise in quality, leading to increases in price. At Bella Vista, cherries are received everyday, both from farms owned by Luis Pedro and his family, as well as farms managed by Luis Pedro. Bella Vista also processes coffee for nearby farms; Luis Pedro buys coffee from these farms, processes at Bella Vista and then sells this coffee. At Bella Vista I cupped many hundreds of coffees and ended up buying from just a handful of farms in the Antigua region: Buena Vista, La Folie, Santa Cruz, Felicidad, Potrero, Colombia, El Rosario and also a coffee called Hunapu. Hunapu is the original name of Vulcan de Agua, in the native language K’iche, which is one of the most prominent of the native languages in Guatemala. Hunapu literally means "mountain of flowers” and is the brand name for coffee processed at Bella Vista. It is a blend of coffees received at the mill and it is separated by day-lots. Most of the coffee is of the bourbon varietal but there can also be a mix of other varieties, like caturra. The reason the Zelayas have chosen to make this a blend is because it is only within the last couple of years that the speciality coffee industry has focused on seperating lots and talking about varieties. The Hunapu blend is made up of coffee picked on the same day by different producers and is based, in part, on the amount of coffee delivered from each farm. It is simply not sustainable for Bella Vista to process two bags of cherry from each producer. However, the Hunapu blend is changing; one of the biggest deliverers to the Hunapu blend, Dario Hernandes, is now beginning to separate his own day pickings. We bought four bags of Dario’s coffee this year and are encouraging him to separate everything for next year’s harvest. I was fortunate to spend a lot of time at Bella Vista and by spending so much time with one producer, I learned much about how things work, not only Bella Vista and the wider Antigua region but also within the coffee industry as a whole in Guatemala. It has been an interesting learning experience and I am looking forward to the continuation of this relationship. Four months after my visit, I am sitting here awaiting the container I helped organize during my trip. While in Guatemala in February, I also spent a weekend at El Injerto in Huehuetenango, the winner of this and previous years Cup of Excellence competitions. El Injerto is truly a magnificent farm which has, in the last year, begun to organize its own online auction. This year the Collaborative Coffee Source will coordinate buying from this auction which will be held on Tuesday, June 19th. At the end of my five weeks away, I briefly visited Colombia, Costa Rica and San Fransico and was back in Olso for only a month before going back to Guatemala in May as part of the international jury for Cup of Excellence. It was really nice this time because I got to cup coffee, wonderful coffee, from all over Guatemala, rather than just from Antigua. Overall, I would say these past months have initiated a good basis for understanding a new origin for me; an origin that we at the Collaborative will work with a lot in the coming years, with our espescially skilled partners at Bella Vista. 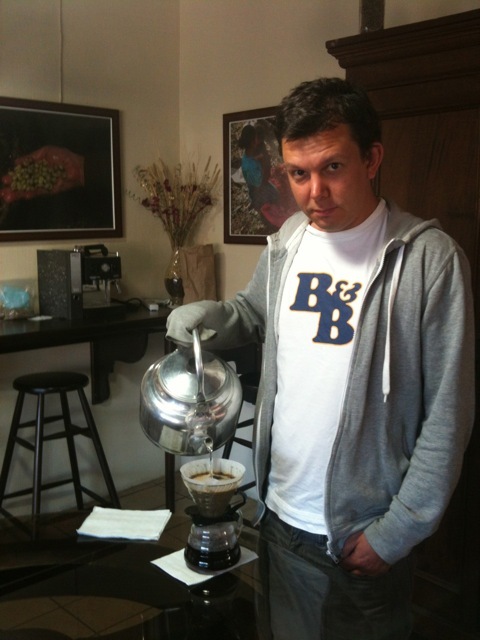 Josh has now dialed in his espresso and it is a complex one with a fresh, crisp acidity that reminds me of lemon candy. I wish him all the best in the competition. It's now time for me to pull up my sleeves and stack 375 bags onto pallets with the help of my good colleagues… and maybe Josh as well. Looking forward to see all the nice Guatemalan coffee on shelves all over Europe, maybe we can all taste them together one day soon. Good afternoon, good coffee people! It's already been close to five weeks since Bjørnar left Oslo for Antigua. He's been cupping furiously during this time and he's put together a container of fantastic coffees processed at Bella Vista by Luis Pedro Zelaya and his team. He's also been mastering Spanish during this trip - his language course was one of the main reasons for his going away. I realize this doesn't tell you much (unless you've bought or tasted coffees from these places before). Bjørnar and I are hosting a cupping on April 4th from 13.00-16.00 at KAFFA for those of you who are interested in tasting these coffees yourselves. The container will be shipped next week and will hopefully arrive first week in May. 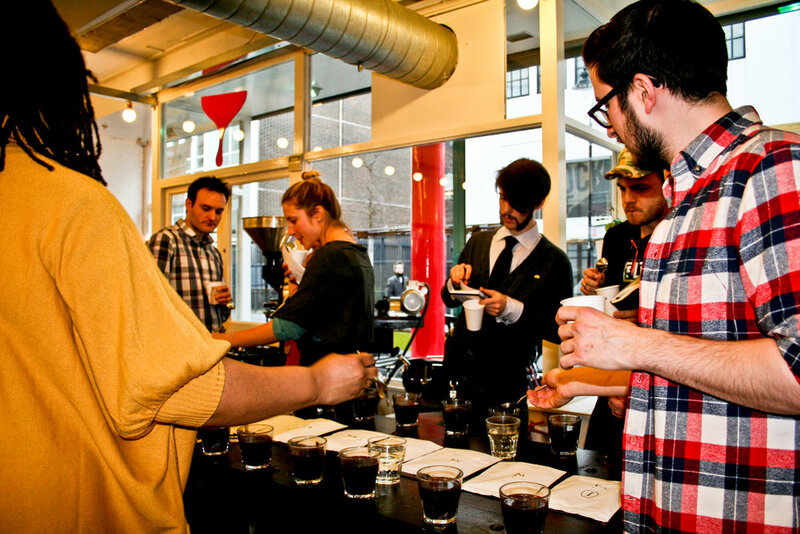 At our cupping, we will also sample the Kenya coffees that will arrive this month. Let me know if you're coming! Hope to see you then.